"Just say no to Timsanity." "Tebow is a novelty act with limited quarterback skills." "The Jets should consider trading for Tim Tebow only if they are looking for a new starter at team chaplain." "Tebow is nothing more than a fullback." "I thought he was the worst thrower I had seen in the NFL in all my years covering the league." "The last thing that fragile locker room needs is another New York media-frenzied distraction." 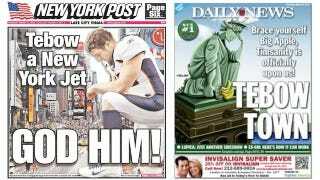 Today, the front page of the Post feautues a 100-foot-high Tebow kneeling in the middle of Times Square. The back page of the Daily News sends the Statue of Liberty into genuflection. Headlines read "Jets' Prayers Answered," ledes begin "Move over, Broadway Joe." This is the way of things in the sensational, reactionary world of the tabloids, where it doesn't matter what side you're on today, as long as you're on the popular side tomorrow, and you're on it loudly. It's entirely possible that these standard-bearers of yellow journalism (not a slur!) will devote reporters solely to following Tebow's every move—certainly they'll devote an extraordinary amount of news hole. Already the Daily News has spilled precious newsprint on wondering which of NYC's eligible bachelorettes might be The One for young Timothy. What does that have to do with anything? Not the point! Splashy photos, inane grabby headlines, unchained speculation, and Tebow, Tebow, Tebow. Tebow's probably not going to help the Jets very much, but he is still an angel at the circus. This is a wondrous confluence of the lightning rod and the storm, a man who can turn even the national media into a tabloid coming under the actual tabloid crosshairs. So maybe it's not so revolutionary that Tebow will be in the news every single day while in New York, since he managed to be in the news every single day while in Denver. But this is different; this is more. And it's not addition, or even multiplication of coverage. This will be an exponential explosion of gossip and back page and twitpic updates of Tebow's every move, every gesture, every slip-up, every triumph. Even if we're not Jets fans or Tim Tebow fans, we're likely fans of Tebowmania and all the accompanying absurdity. If so, it's our prayers that have been answered.